India’s first theatrical improv company, Improv Comedy Mumbai, is performing in Seattle this week as guests of local company Unexpected Productions. A mournful loner walks into an Indian restaurant looking for butter chicken, only to find an angry father frantically waiting tables around his drunkenly marauding son. It’s the type of absurdly silly and genuinely empathetic scene only improv theater could provide — with an Indian twist by way of Mumbai. The father and son in this scene, which I caught at the Market Theater last weekend, are both members of India’s first theatrical improv company, which is performing in Seattle this week as guests of local company Unexpected Productions. Improv Comedy Mumbai was founded two years ago by Seattle native Adam Dow, who himself came up through Unexpected Productions. He says he saw an opportunity in the “L.A. of India,” where actors and performers are plentiful and comedy is popular. And while local performers were eager for the opportunity to learn improv, it took audiences a moment to decide they wanted to watch it. That unscripted quality and audience inclusion is in contrast with the highly choreographed and produced Bollywood productions Mumbai is famous for. 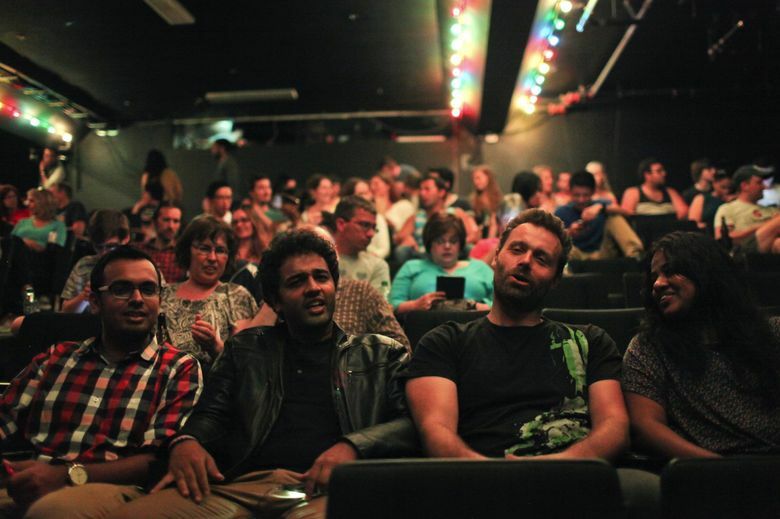 And while it’s taken a few years, Comedy Mumbai performers say audiences are now growing. But the company hasn’t completely denied the glittery lure of Bollywood. In fact, they’ve capitalized on it. The group has become known for its “Bollywood format,” where audience members are asked for locations and themes that are used to create an entirely improvised Bollywood movie, from beginning to end, with song and dance numbers, on the spot. They’re all quick to reassure me, though, that their show is only an hour and half long — not the three-hour-plus runtime of most Bollywood films. They’ve brought their act to Seattle in the form of a show called “Red, White and Bollywood.” They’re performing at the Market Theater next to the gum wall (just follow the smell of heat-activated Bubble Yum if you get lost) and promising an unconventional — and air-conditioned — way to celebrate Independence Day weekend. Indian actors adopting a western style to re-enact Bollywood dance numbers in honor of the Fourth of July might sound too weird to work. But improv comedy is just the medium for this type of cultural mash-up madness. Challa admits that a story can get a little confusing when you’re struggling with cultural references and language barriers (the group performs in Hindi at home and in English abroad). “We figure out the story along the way,” he says, laughing at the memory of performing in a recent skit about Lamaze classes, which he’d never even heard of. Challa says he looks for the universal instead of obsessing over cultural accuracy in his performances. Whether it’s a person with a desperately full bladder, a vain muscle builder or a misbehaving drunk, some humor needs no translation. And when that approach fails, well, that’s OK, too. Whether they’re in Mumbai or Seattle. “Red, White and Bollywood” is showing at the Market Theater tonight at 8:30 p.m., Saturday at 7 p.m. and Sunday at 8:30 p.m.